Photo by Fabio Bruna, discovered on Small Notebook. I’m dreaming of a dining room table. Yes, I know we sold ours last year at a garage sale, after it had been sitting in the garage for months, but still. Things were different last summer. Eric and I were two singles in a relationship, sharing a home and hunting for solo space in our sweet but cramped bungalow. Okay, I’ll admit it: I was the one hunting for solo space. Clinging to my autonomy and independence. Not realizing what a blessed, lovely relief it is to set down that mantle and officially say yes to togetherness, to shared space both inner and outer. To become a family. Now I’m dreaming of gathering up, of coming together at the start and end of the day. Eating Sloppy Joe’s by candlelight and basking in the warm California late summer breeze coming through French doors. Sewing in the late morning light while tiny feet tuck up underneath curious leaning little bodies, watching the needle go up and down. Game night with friends and neighbors laughing as the storm rages romantically outside. Black lab happily laying underneath, snatching up dropped crumbs and keeping dangling feet warm. Maybe it’s the bitter cold outside, the long distance from my beloved and loved ones, the lone nature of the job I’m on right now – don’t get me wrong, I enjoy it in its own way. But tonight I feel so warm when I think about a simple dining room table, and how to reclaim this gathering place, this hub of family life once I get home. What’s your favorite way to gather up? I am so heartwarmed when I think of you and Eric as a Family. gathering up at home ideally involves a kitty for warmth… a book in quiet times..
Love you. Happy travels, Intrepid. Thanks for asking! I’m tickled with the solution we came up with for dining, game playing, and family gatherings (three of our favorite things.) This works very well in the space we have now. We bought two drop-leaf tables. Each of them is 36×36 when the leaves are down and 36×60 when up. We keep one in our dining area for use every day and one in the living room in a corner reserved for games. (We played cribbage night before last.) But, when we have a family gathering all the leaves pop up and we have two dining tables that are 5 feet long each. I hope you can find something that works just as well for the place you and Eric share as home. I know you are both creative and will find that AH HAH moment. I hope this helps you find the box to think outside of. I had to laugh at your reference to a little one watching the needle go up and down. Just don’t let that little one do what you did and put your finger under that needle! It will punch right through the little one’s little fingernail. 8-( Do you remember? 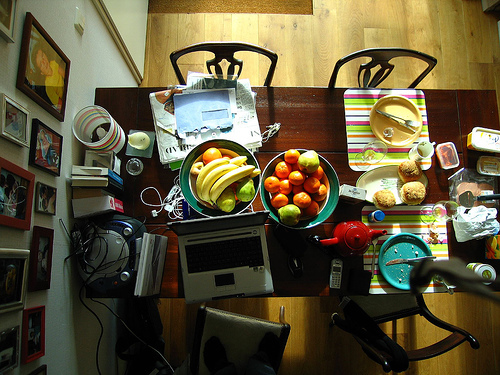 I love the concept of the dining room table. I guess that’s why there’s always a meal as part of our family gatherings, even when we have game night, which we should really do more often. There just might be a book beginning for you in this blog. Oh gosh, I do indeed remember getting my lanky little finger caught in the sewing machine! Maybe we should consider my love of sewing to be a morbid fascination? Great, great post! My dining room table, by the way, is cluttered at the moment! Gathering up? One of the things we love to do as a family is dance. It could be a winter day when we get distracted from decorating the Christmas tree to Christmas music (usually something fun like Harry Connick, Jr.) or putting Swing or Disco on and acting like crazy people. Even my 10 year old will still dance with me and his sisters. We recently bought a pew. Yes, a church pew (which reminds me I still need to pick it up). I think we’re going to use half for a bench in the family room and the other half will become a bench for the dining room. I’ve wanted a new table with a bench on one side where all the kids could sit together for some time now.